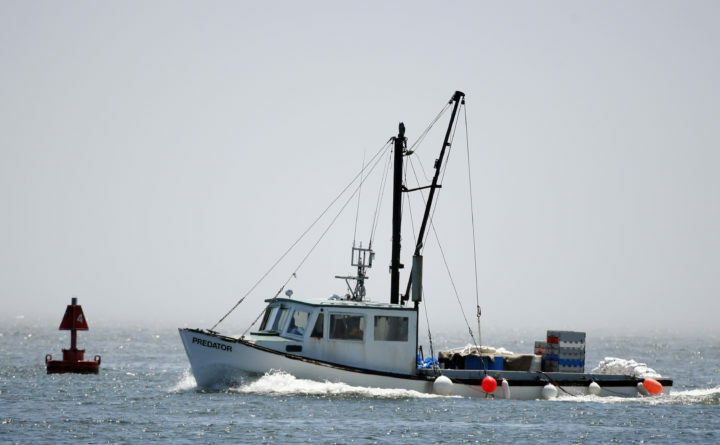 A commercial fishing boat heads out of Portland Harbor in Portland, Maine in this June 25, 2009, file photo. Terry Alexander has fished for 40 of his 57 years, catching groundfish in the winter and squid during the summer months, off New York and Rhode Island. Throughout the 35-day federal shutdown that ended — perhaps temporarily — on Friday, the Cundy’s Harbor man and his four employees continued to head out on the “Jocka” to haul in groundfish such as cod, haddock, flounders and pollock. Alexander said the shutdown may have long-term consequences for him and for other Mainers who make their living fishing for groundfish. “If they have another shutdown, it could be catastrophic for New England groundfishing,” he said by phone from a meeting of the New England Fishery Management Council in Portsmouth, New Hampshire. Alexander said a memo Monday from the NOAA Fisheries Greater Atlantic Region regional administrator Michael Pentony about the backlog of work for federal regulators only added to that worry. Pentony wrote that staff would focus on a significant backlog of time-critical work accumulated during the 35-day shutdown. NOAA and the Greater Atlantic Regional Fisheries Office authorize and approve permits for fishermen in federal waters in May for the next year, except for scallop permits which are issued in April. The permits must be on the boat before it can fish. Ben Martens, executive director of the Maine Coast Fishermen’s Association, said some Maine fishermen have bought new boats and are concerned about financing falling through if permits are delayed. “It’s close to the end of the fishing year, and they need to know how much is left on their permit,” Martens said. Martens said he learned Tuesday at the NEFMC meeting that the organization’s spring survey of fisheries might also be delayed due to the shutdown. The Atlantic States Marine Fisheries Commission’s 2019 winter meeting, at which preliminary stock assessments of different fisheries are approved, is scheduled to take place Feb 5-7, but the regulatory organization warned that the federal shutdown might force a delay because they require products or actions from federal partners. Board discussion may be limited or deferred, the organization said, and agendas could be modified. “The federal scientists haven’t been able to do the work [to prepare] the stock assessments,” or to do other data-driven work, Martens said. Fortunately, groundfishing advocates have completed some of the work for the scientists. The federal government tracks overall quotas for a number of species including scallops and groundfish, and collects data to provide an overall picture of the fisheries. Alexander said the manager of his sector kept him updated on his quotas, but he said despite the extra work, another shutdown would most likely delay the permits.